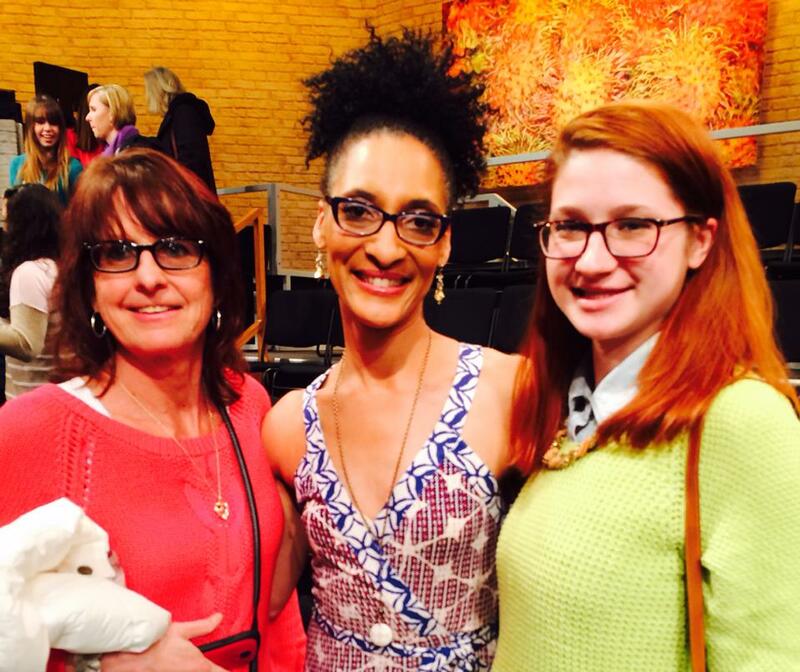 About a week ago, my mom and I took a trip into the city to see a taping of ABC talk show, The Chew. I wish I could say that the whole experience was on a whim, BUT a lot of planning went into making the day a success. I don’t personally watch the show daily (especially not when I’m in school), but over the summer I would always find myself catching episodes while I was at the gym, go figure! Knowing I was going to be home for spring break, I figured it would be a great idea to witness what goes behind the scenes of a food themed TV show. Request Your Tickets: About a month or two before the show date you’d like to attend you must fill out a request at THIS website stating who you are, how many people are in your party, the date you’d prefer to see the show, and a back up date. The Follow Up: After RSVP-ing you will receive a few emails as the show approaches regarding what to bring and what wear for the taping. The show I saw was on the first day of spring, so we were told to wear bright and jewel tone colors! suggest getting their earlier because there really is not guarantee you will get into see the tapping. Once you arrive at the studio, you wait outside on line and producers usher you in by group. Once you get in, you receive a ticket and they guide you into the waiting room which has small snacks and water. THEN, they begin to call tickets and take you into the studio, seat you, and you enjoy the show!!! I went to see the show on a Thursday; however, it was really the Friday morning show they were taping. I was really interesting to watch all the people and preparation that goes into the show before they started taping and during commercial breaks. They went from having the 4 co-host being the only ones on set to a mob of 30 people moving things and setting up during breaks. It was also incredible how many young people were working on the show. Most of the producers had to be only in their mid twenties! Left: Carla and Michael Symon greeting some audience members. Right: Clinton taking a selfie with an audience member. The hosts, Chef Michael Symon, Carla Hall, Clinton Kelly, and guest host Chef Curtis Stone (taking the place of Daphne Oz and Chef Mario Batali) were incredibly friendly. During commercial breaks, they talked and danced with all of the audience members, especially Carla! They took pictures and chatted with the audience after the show ended and all of them seem to be having a really good time and were enthusiastic towards being there. The people who sit on the tasting panel are chosen in advance of the show, which was kind of a bummer because I would have lover to be up-close and personal to the cooking! During the show Chef Michael Simon made grilled shrimp and a pea salad, which the panel and a handful of audience members go to taste, Curtis Stone made Tipsy Arnold Palmer made with ginger ale and Bourbon, and Carla headed the craft corner for this show, making springtime table centerpieces out of coffee filters. The one thing I wished was that they supplied the entire audience with sample of what they were making, but you can’t have it all I guess! 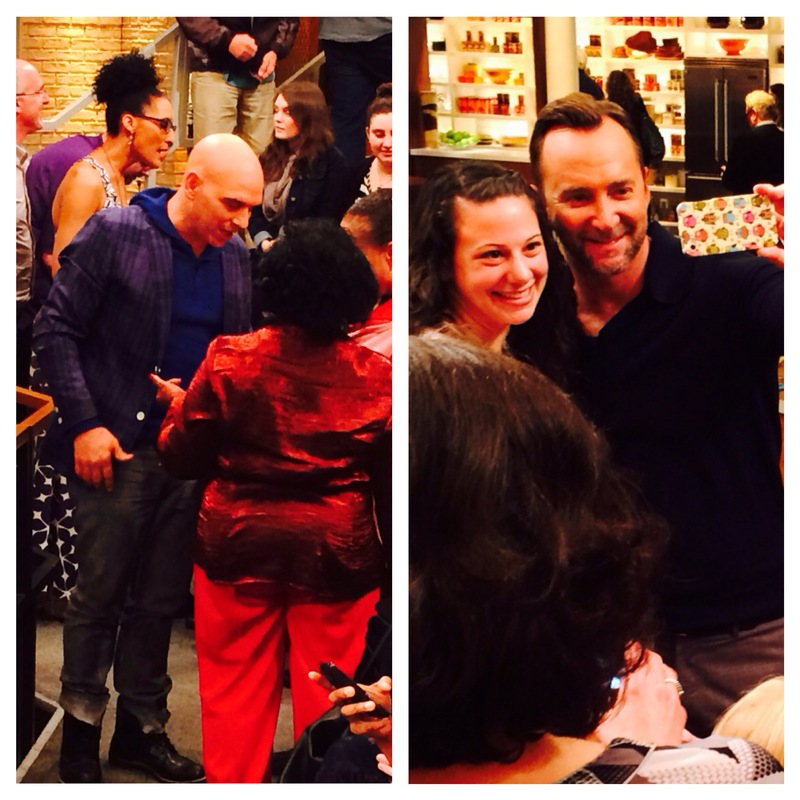 After seeing the taping of the Chew, I realized it isn’t as much about the preparation and technique of creating the food or crafts, but rather the personalities of the co-hosts and their interactions with each other, guests, and the audience. Seeing The Chew was a really fun and inexpensive experience ( the tickets are free, the only thing you need to worry about is transportation to the studio and maybe getting a bite to eat after the show). If you live close to the city and are looking for a behind the scenes look at a fun and fresh talk show environment, I’d recommend you check it out! 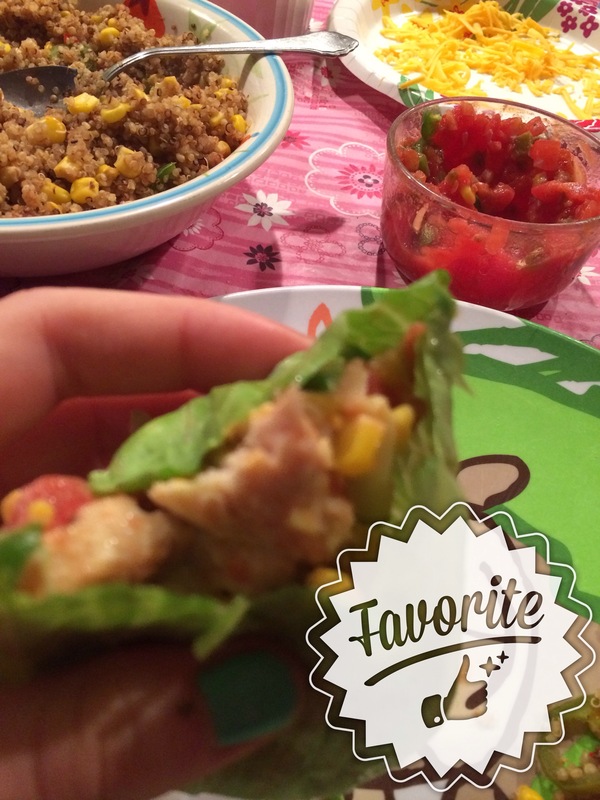 That’s a Wrap: Breakfast Edition! 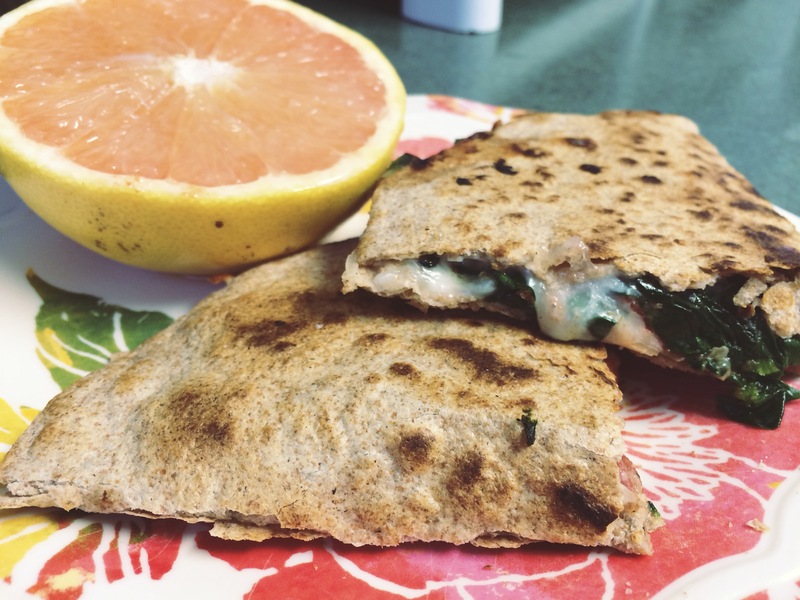 So on the last edition of That’s a Wrap, I gave you a recipe to my italian twist on a quesadilla. 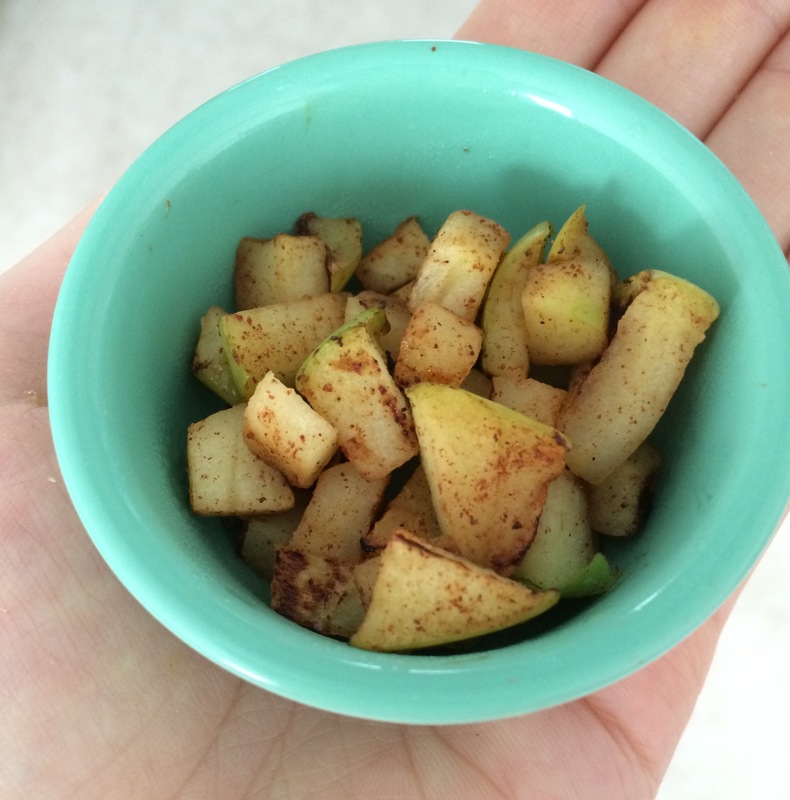 Set aside half of the apple slices, then take the remaining apple slices and dice then into small pieces. In a frying pan on medium heat, add the diced apples mixture and sauté until softened and caramelized, usually 2-3 minutes. Then remove from heat and set aside in a small bowl. Then spread peanut butter throughout the wrap, leaving about a half inch from the edge plain, without peanut butter. 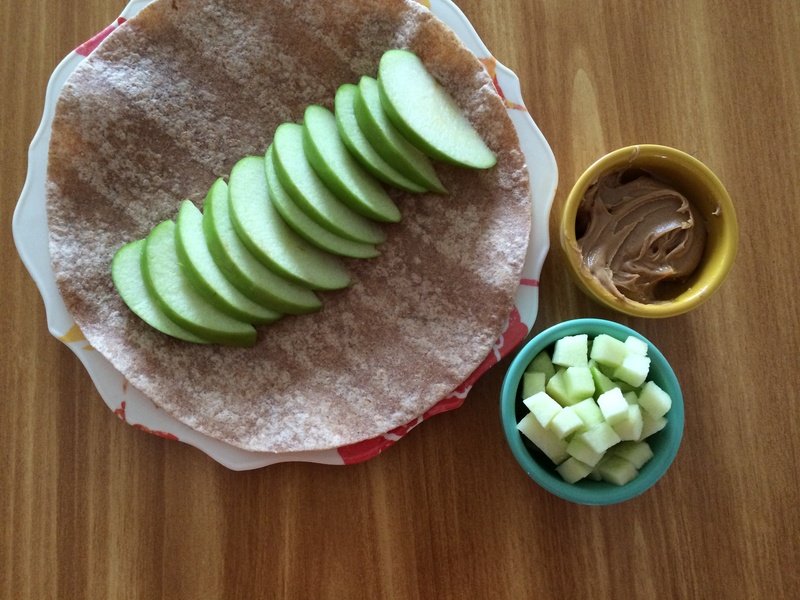 Then arrange apple slices on one side of the wrap (See picture for how I assembled it). Return frying pan to medium heat and place the dressed wrap flat in the pan. Allow to heat for about 2 minutes, or until peanut butter begins to melt/liquify. Scatter the previously sautéed cinnamon honey apples on to the wrap. Fold over the side of the wrap without apples. Leave it heated on this side until the wrap reached desired crispiness. Then flip and repeat. After your quesadilla is cooked to your liking, remove from heat. Let cool for a moment and then enjoy the peanut butter goodness! I used granny smith apples because they are sour, which is a good complement to the sweet and saltiness the peanut butter brings. However, any apple of your preference would work. As for peanut butter, I prefer Skippy Natural, but any peanut butter of your preference would do the job. I bet this would be great with crunchy pb or even almond butter for an even healthier alternative. Although, I made this on heat you could make this cold if you are on the go or to take for lunch. 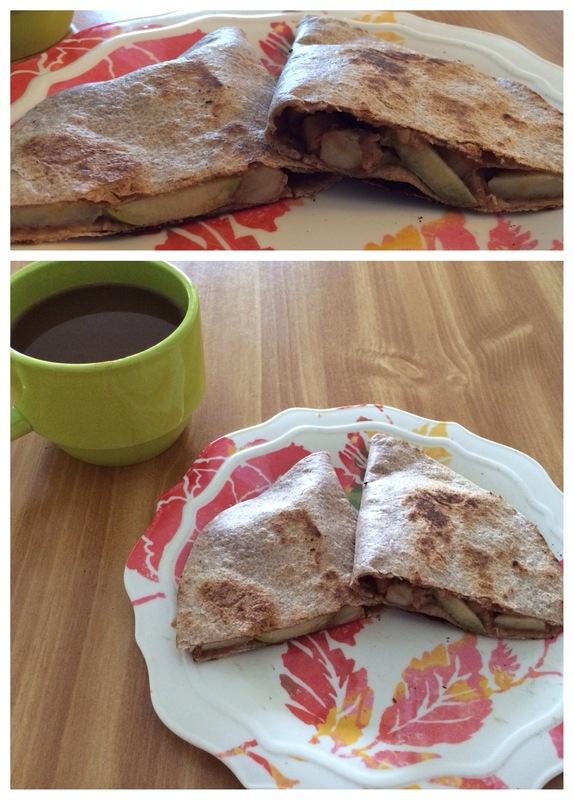 Being a lover of peanut butter, this warm mix of peanut butter and apples was a perfect and tasty breakfast! 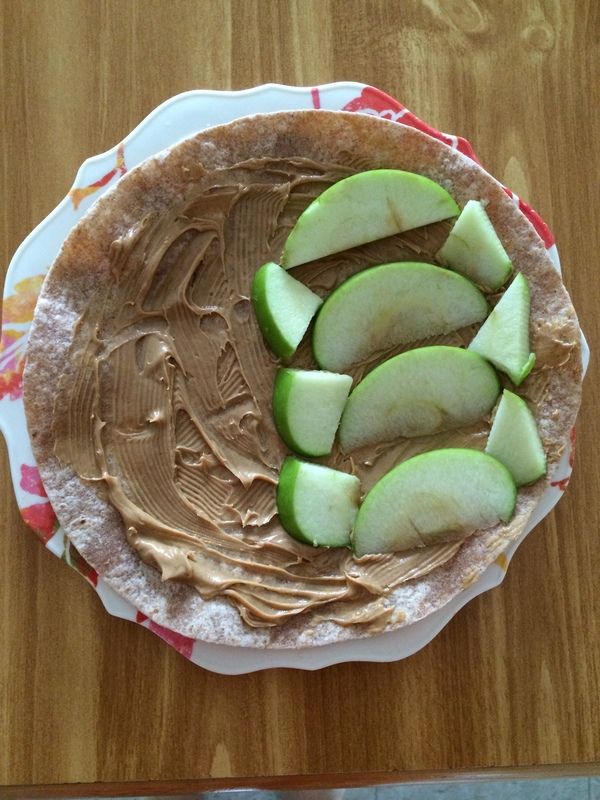 With the apples and the whole wheat tortilla as a source of fiber and peanut butter for protein, this breakfast quesadilla has all the nutrients to start the day off right! And with the added cinnamon and honey to add a depth of flavor, this sweet “quesadilla” is a sweet and satisfying meal. Going to school in the Hudson Valley, for a foodie like myself, is dream come true. Down the road from Culinary Institute of America and surrounded by tons of amazing eateries, I’ve taken advantage of all the good food surrounding me. This weekend a friend and I ate at a place I’ve been eyeing for quite a while, Soul Dog, and I can tell you it was an extremely soulful experience. They even have the option to create your very own customized dog in which you select the type of dog, bun, and array of toppings you want all with the option of making them glutton free! 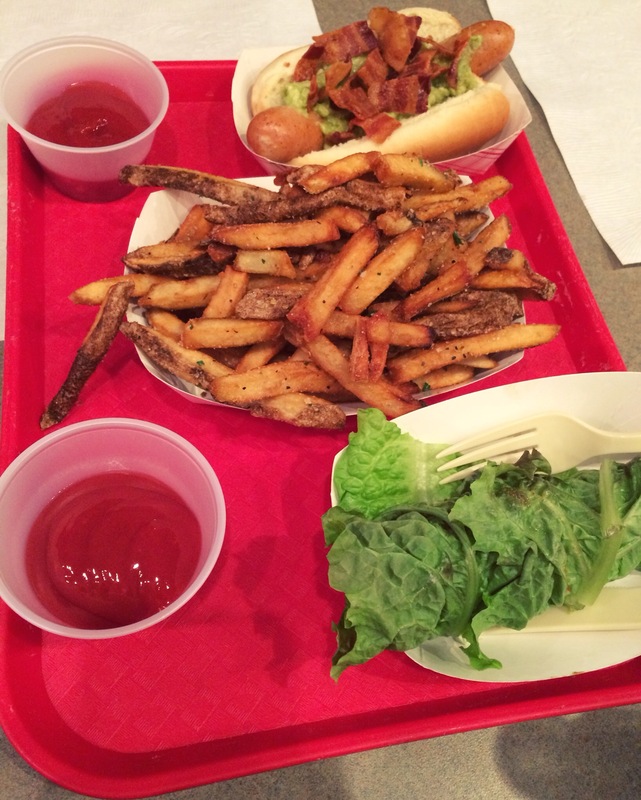 They also have sandwiches and other specialty items, including soups, nachos, a beer and wine menu, and a kids menu, so Soul Dog is guaranteed to satisfy. 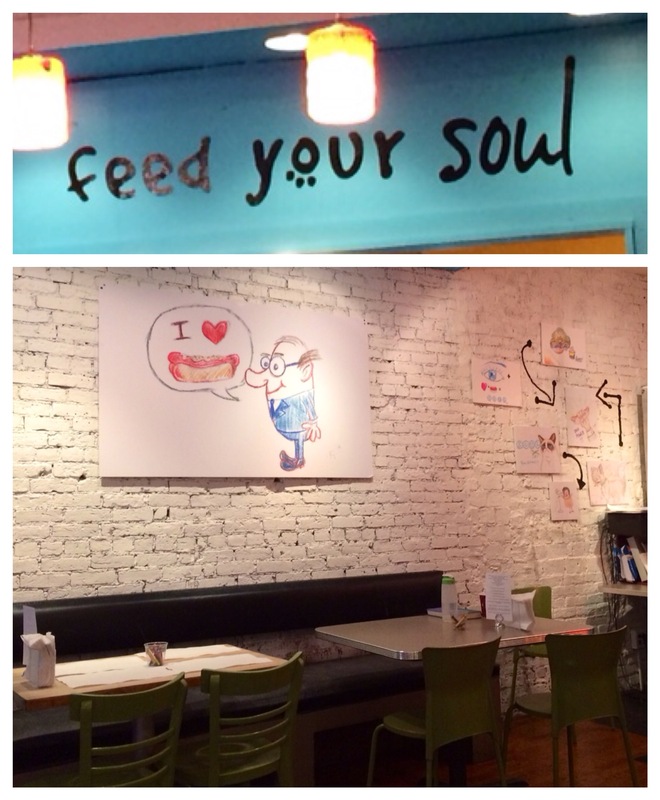 A look at the interior of Soul Dog! Not only is the food awesome, but the interior of Soul Dog is bright and unique. 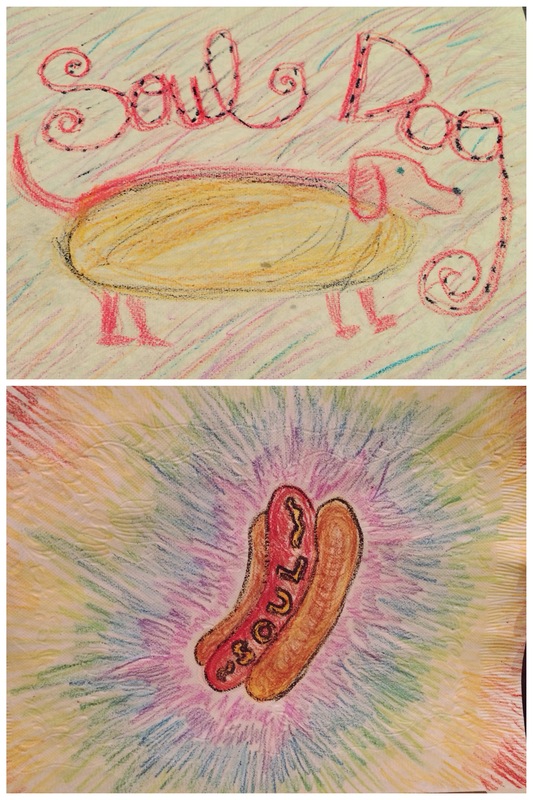 With crayons on every table, guest are encouraged to draw something soulful that they may even hang on their walls! have made it a mission to try everything on the menu! If you are in the area, I encourage you to check it out because it’s affordable and pretty stinking good. Whether you are glutton free or not, Soul Dog has a little bit of everything to insure a soulful eating experience for all! Being a college student on a budget, I gotta work with what I got. And as the weeks approaching spring break are dwindling down, I’m trying to use all my perishable food before I leave to make sure nothing goes to waste. Luckily on my last trip to the grocery store I bought a package of whole wheat tortillas, which are extremely versatile and can be used for wraps, quesadillas,chip and the list goes on. 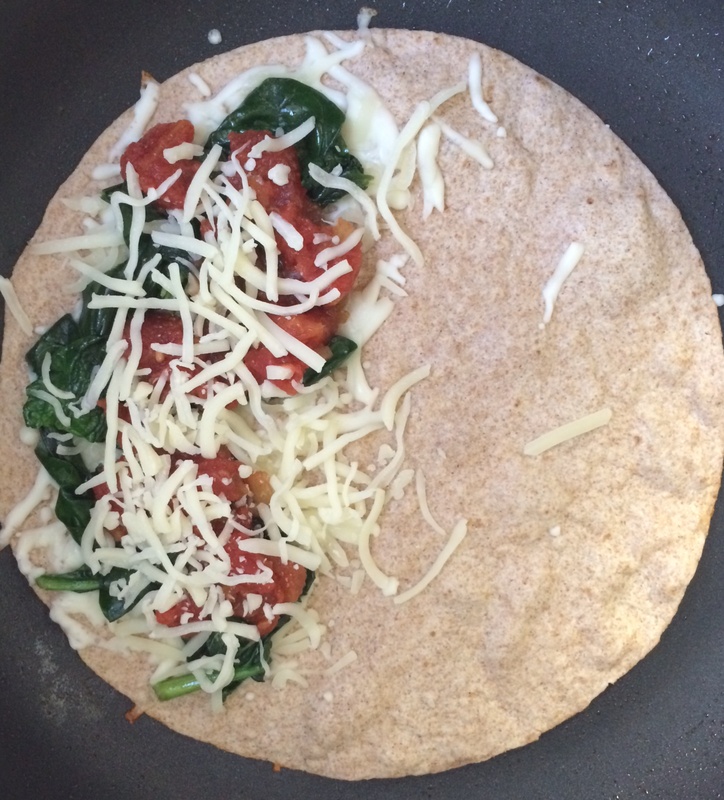 Measured out spinach, tomatoes, and cheese. In a frying pan on medium heat, add 1 teaspoon of olive oil, and spread throughout pan. 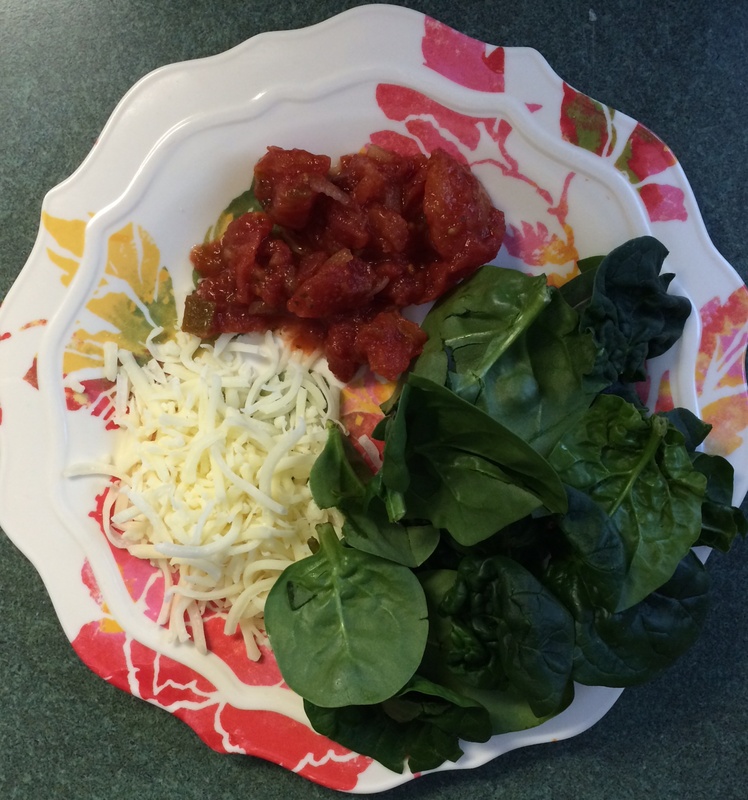 Remove the pan from heat and set aside cooked spinach in a bowl and mix with the diced tomatoes. Place the pan back on medium head and place whole wheat tortilla flat into the pan. Before folding the bares side of the tortilla over, let the top cheese melt almost completely. Then you should be able to fold it with a spatula. After you have folded the wrap so it is quesadilla like, you can remove from heat or keep in pan and flip until the wrap has reached its desired crispiness. I added a half of a grape fruit to finish off a delicious and nutritious meal! 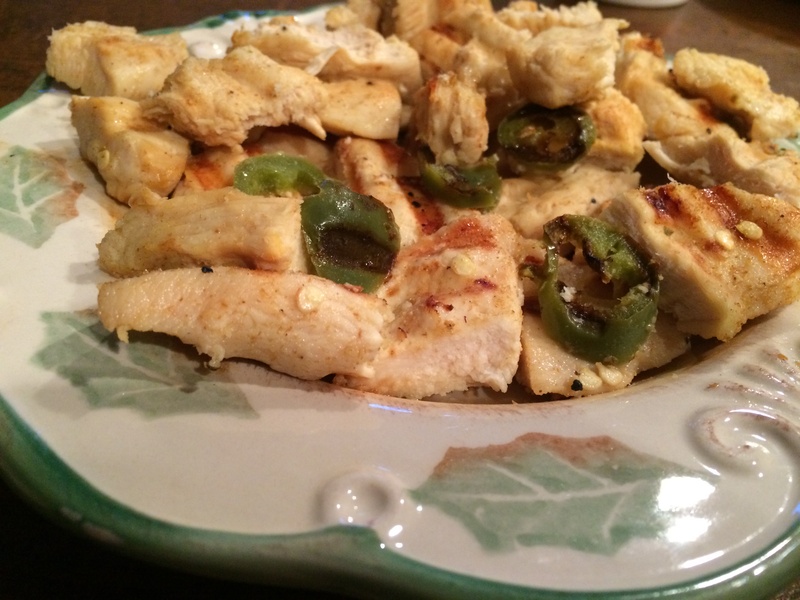 This meal is definitely an alternative to your traditional quesadilla. By adding spinach and tomatoes, and using mozzarella cheese, it strays far away from the traditional Mexican flavors and instead incorporates some added Italian flair (we all know how much I LOVE Italian food). This recipe can manipulated and changed effortlessly by incorporating different ingredients, or by adding a little more this and a little less of that it really gives you the opportunity to make it your own. 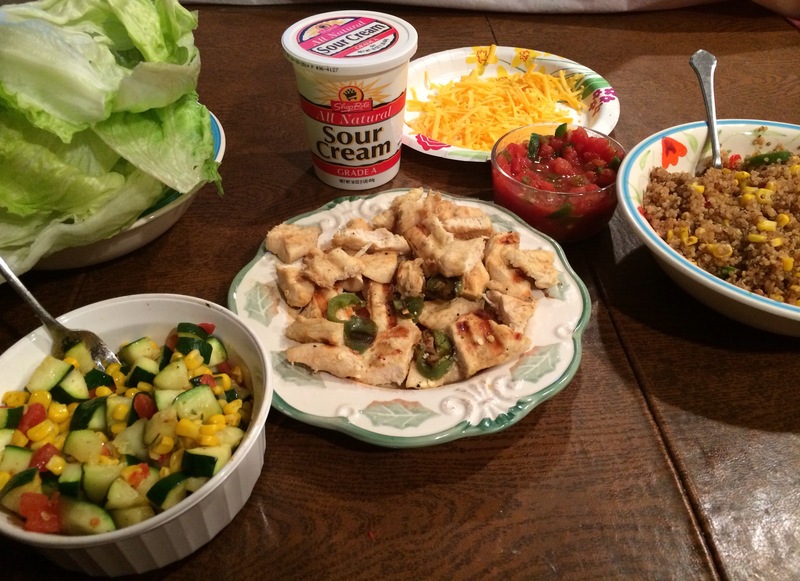 Over all this meal took me about 15 minutes to make, together with prep and cooking (and probably less time to eat it). 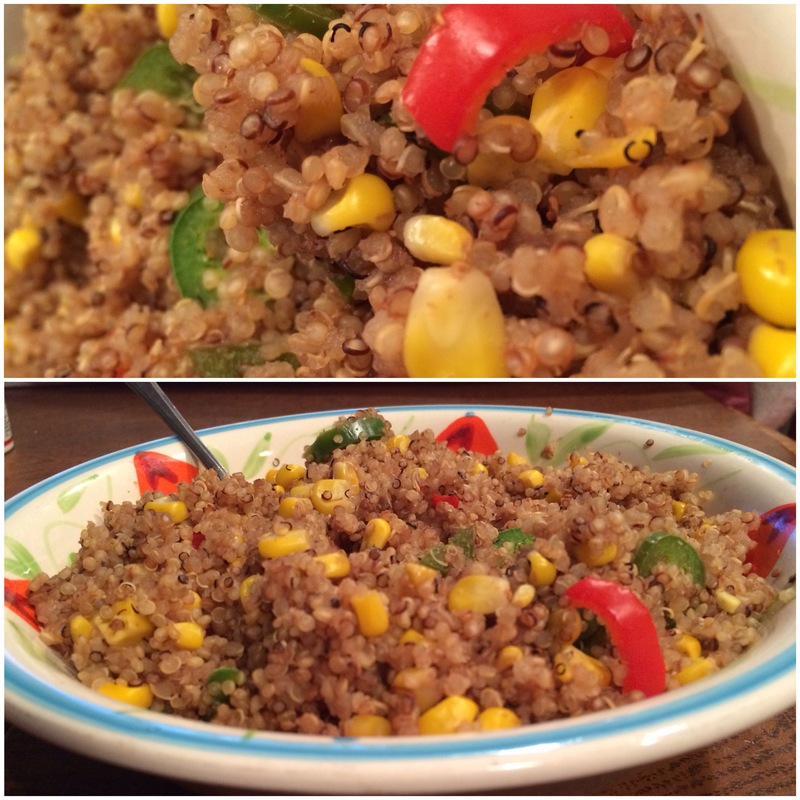 So simple,easy, and pretty darn healthy! If you like this recipe, have longer time to cook and want to greatly develop the Italian flavors of the dish, check out Giada De Laurentiis’s version of an elevated Italian quesadilla. 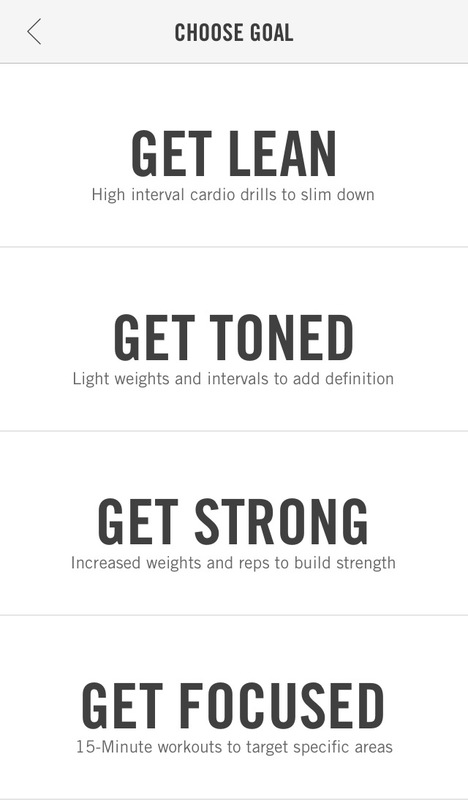 This app allows you to customize a workout program specifically to the kind of work out you are looking to get. To start off, you choose a GOAL (get lean, get toned, or get strong). Next,you choose your LEVEL (beginner, intermediate, or advanced). Lastly, you choose if you’d like to include running into your plan. From there, the app produces a 4 week workout program to follow with specific workouts for each day, Basically acting as a personal trainer, but saving you hundreds of dollars! 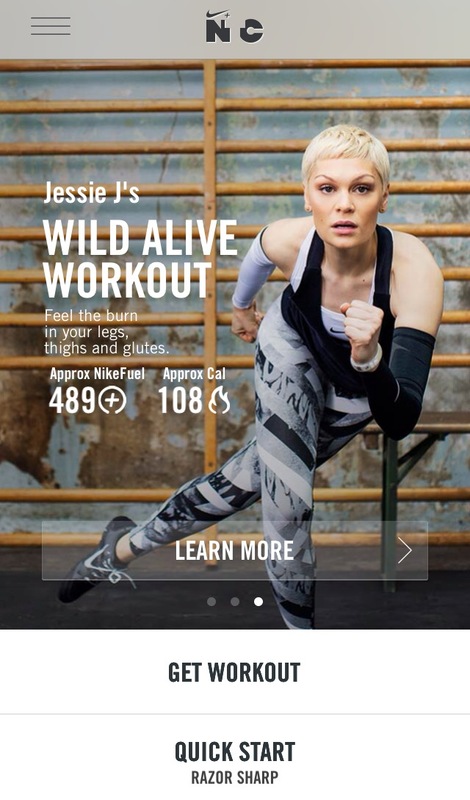 The app is formulated to provide you with different types of workouts for different days. Price: FREE from the App Store! I personally use this app quite often on top of my regular cardio routines. I really love the different variety of workouts that are provides from relaxing yoga to intensive strength exercises. It is also a great solution to days that I do not have time to make it to the gym because of my busy schedule, with each exercising ranging from 15 to 45 minutes. What are some of your favorite apps? Share in the comments! 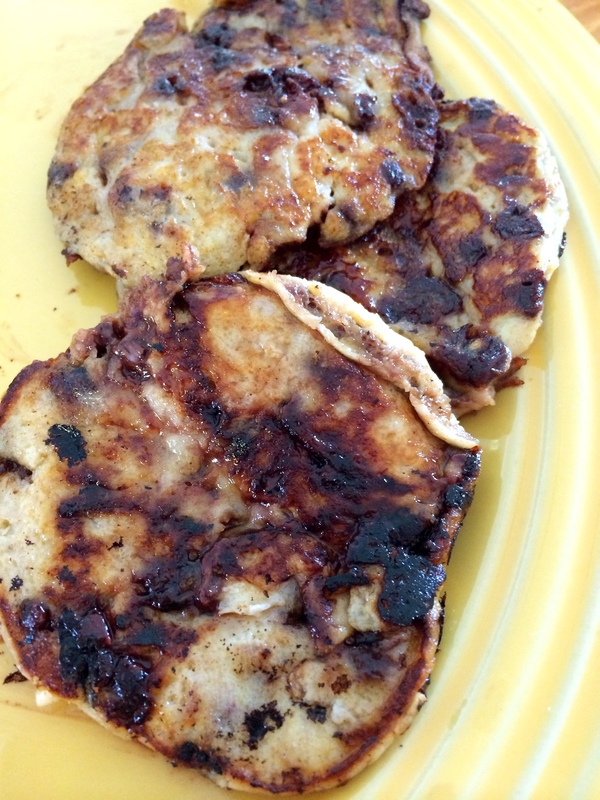 Make you BANANA PANCAKES, pretend like it’s weekend now..
My banana pancakes with chocolate chips! Pancakes are the perfect Sunday morning breakfast, a bright and fluffy start to the new week. Like many times my eye are far bigger than my stomach and I will eat WAY too many pancakes leaving me stuff for the remainder the day. So when I came across this recipe for three ingredient flourless pancakes that are only 65 calories each, I thought it was WAY to good to be true and of course I needed to try it out and be the judge. The recipe requires three simple ingredients: 1 banana, 1 egg, and blue berries (or any other added ingredient of your choice). This recipe is really simple! And it only took a matter of minutes from prepping to cooking! HINT: The riper the bananas are, the easier it is to mash and combine into the batter. These pancakes are a little difficult to cook, well flip actually, because they easily come a part easier. TIP: Try using a thinner spatula to flip each pancake. It will make it easier to flip the pancake without it falling apart. You can add almost anything to the batter making it your own. I chose to do chocolate chips and strawberries. TIP: Make the pancakes relatively small ( I used a 1/4 cup to measure out the batter). This allows the pancakes to cook evenly and makes flipping easier. I also added about 1 tbsp of cinnamon to the batter for more flavor. My failed first attempt making the banana pancakes with strawberries. 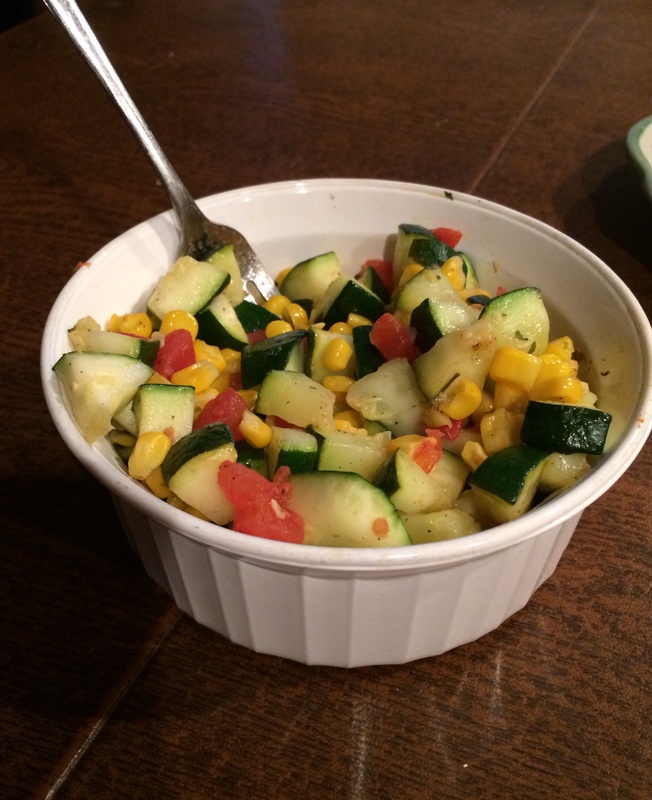 Review of the Recipe: I’m glad I tried this recipe! At first I had my doubts that they were not going to taste anything like pancakes, but they really did taste like banana pancakes! HOWEVER, my first batch (which included strawberries) were almost impossible to flip because I made them a bit too large and combined with the extra liquid from the strawberries, they did not stay together correctly. Also, because the batter is only eggs and bananas, the ending pancake definitely had an eggy texture, which I didn’t mind. 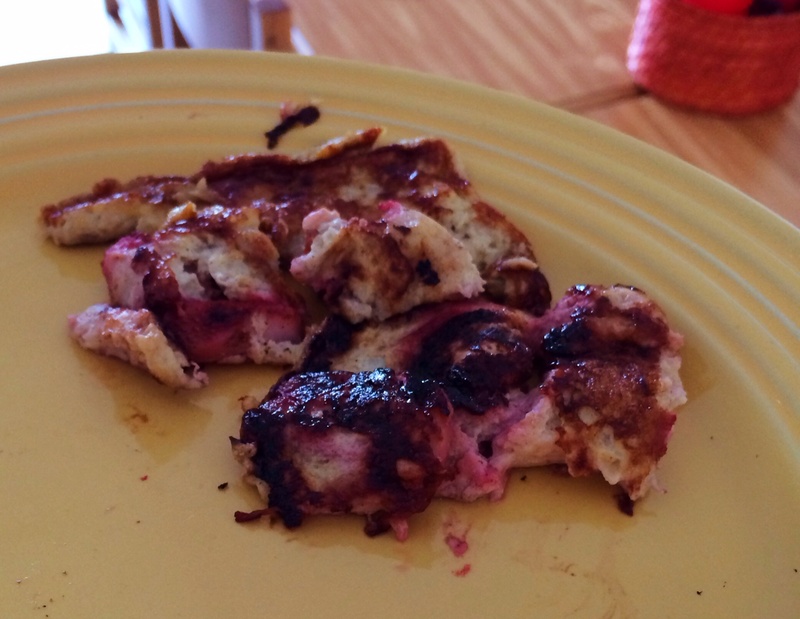 Altogether, these were a pretty delicious healthy alternative to normal pancakes. These are great for anyone with a gluten sensitivity or is just looking for a lighter pancake recipe. HAPPY NATIONAL PEANUT BUTTER LOVER’S DAY! Today, March 1st, marks the beginning of National Peanut Month, and how appropriate that today more specifically is National Peanut Butter Lover’s day! Appropriately, this morning my friend surprised me with a peanut butter and jelly cookie! 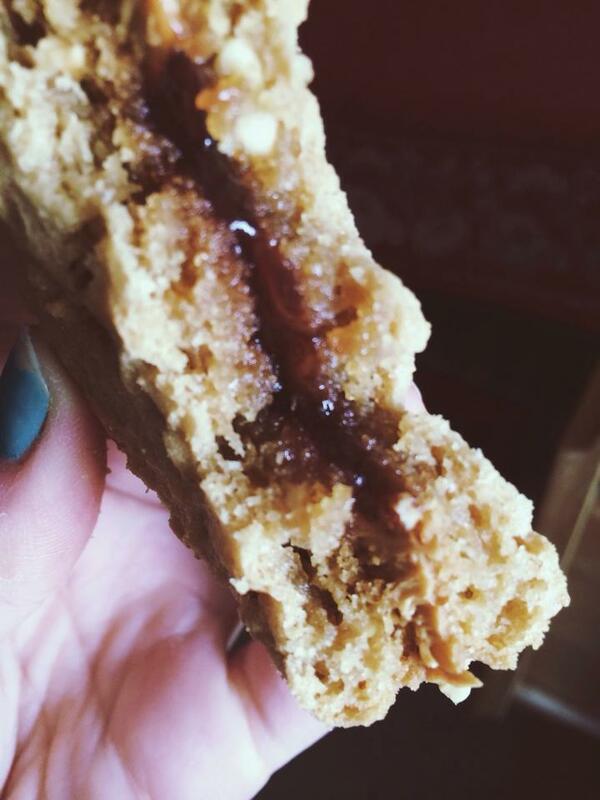 Two peanut butter cookies sandwiching dollops of peanut butter and grape jelly. I would categorize myself as more than a lover of Peanut Butter, but instead I would say that I’m infatuated with it. So much so that sometimes it’s concerning (aka when I finish a jar in two day, woops!). There is just something about peanut butter that get my taste buds going. It’s a bit sweet, a bit salty, and you can virtually put it on anything and it’s fantastic. Because of this (and how much I love it), I regularly include peanut butter in my after workout meals/snacks. Some of my favorites include: Apple/banana,rice cakes, and oatmeal all with peanut butter. I also like combining peanut butter in after workout shakes and smoothies! And of course, I definitely do not object to eating it by the spoonfuls. At the Reading Terminal Market in Philadelphia. 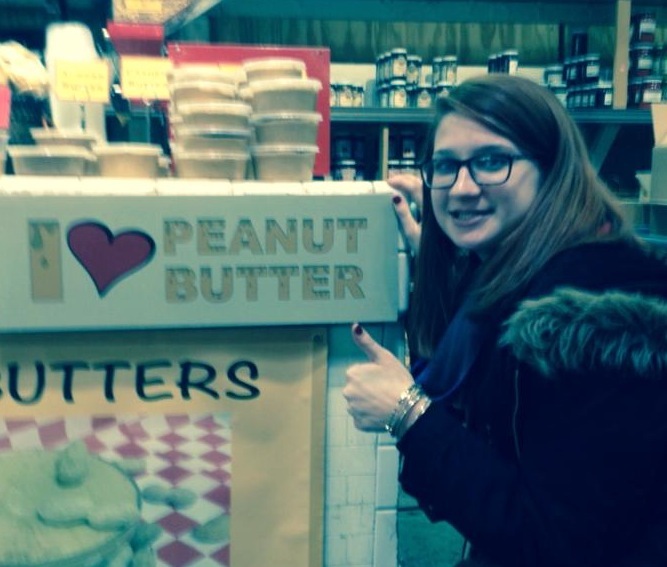 Obviously always showing my love of PB.